Against Me! 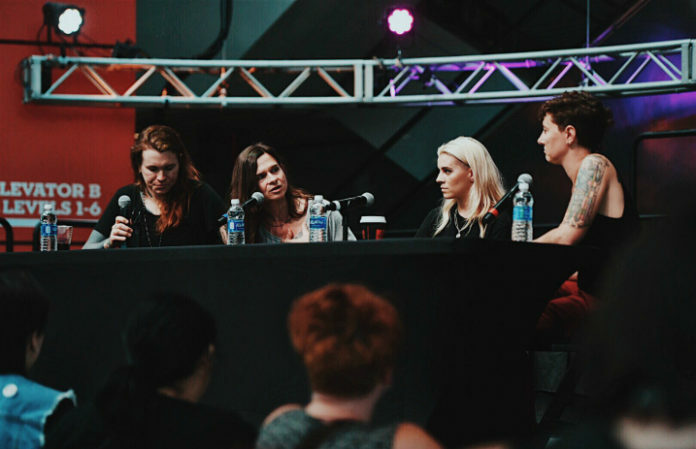 's Laura Jane Grace hosted the LGBTQ in Music Panel, alongside Life of Agony's Mina Caputo and PVRIS' Lynn Gunn. Check out what they said below and how you can watch the panel below! Grace began the panel with talking about what she believes is the biggest issue facing the LGBTQ community right now, citing healthcare. Laura Jane Grace will be receiving the APMAs Icon Award Monday, July 17, at the 2017 Journeys Alternative Press Music Awards. The APMAs Icon Award is given to an artist or group that has inextricably linked themselves to a defined aspect of the cultural history of rock. The recipient has been recognized by both peers and fans as a foundation for change and inspiration, both sonically and culturally. Caputo and Grace shared a special moment on stage where Grace spoke about the award and what it means to not only her but to the scene as a whole. Grace will be presented the award by PVRIS' frontwoman Lynn Gunn. Another important topic that all three women discussed was a safe space in concerts and how they can create a safe space in those environments. “I think it's very up to the artist and what they're representing in how safe a space is,” said Grace. Gunn has talked about the topic of safe spaces in concerts before. “We’ve been working with this company called the Ally Coalition, which works integrating LGBTQ equality into music and art… We have certain organizations setting up, like, merch tables at our shows and even giving kids the resources and people to talk to is another way to create that safe space and let people know that you can be heard and you are welcome,” said Gunn. A portion of every ticket sold for their headlining tour will be donated to The Ally Coalition in support of LGBTQ equality. Be sure to watch the APMAs live starting at 7 p.m. ET/4 p.m. PT on Monday, July 17 and watch the complete LGBTQ in Music Panel below! Next articleQUIZ: Which Hayley Williams hair era are you?